People who are new to Phoenix, or are considering moving to the area, are often concerned about scorpions. Some who live in the Phoenix area can go more than 35 years and rarely see a scorpion that is not in captivity. Others who live in the Valley of the Sun can have quite a different experience. It all depends on where you live. There is no doubt, however, that scorpions do live in Arizona. Here are some things to know about scorpions in general, Arizona's venomous bark scorpion in particular, and how to keep scorpions away from you and your family. Believe it or not, some people don't want to avoid scorpions. They rather like the creepy things and collect scorpion paperweights, key chains, lollipops, and bookmarks. Some people actually collect the arachnids! But most people would rather stay out of their way. Learning about scorpions is the best way to be prepared when you come into contact with them. Knowing what they are, what they look like, how they act, and where they are likely to be found will go a long way toward making you feel more comfortable with living in a desert environment with scorpions. Scorpions have four pairs of legs. They also have pincers that look like little lobster claws. Scorpions come in many sizes and colors, but most of the ones you'll see in Arizona are usually pale gold or tan in color. Although some scorpions in other parts of the world can be six inches long or longer, most of the adult scorpions in metro Phoenix are probably less than 3 inches long. They have a venom bulb at the end of a long tail. The venom bulb is called the telson. There are about 90 species of scorpions in the United States and an estimated 1,500 species worldwide. There are more than 40 species in Arizona. Those numbers are constantly changing as new species are discovered, classifications change, and some species become extinct. Scorpions hide under rocks or debris. They live in crawl spaces. They are active and feed at night. The scorpions that are native to Arizona typically eat spiders, insects and each other, if they are hungry enough. They hide during the day. Check your shoes and clothes before putting them on if you live in an area where there are likely to be scorpions. If you live in an area where there is a lot of construction, you may be more likely to find scorpions inside because their outdoor habitat has been disturbed. They can live for months on water only. Because they are looking for water, you may find them in or under sinks or tubs. Scorpions can live to be over 6 years old. If you are moving to the Phoenix area, rest assured that scorpions are not crawling around everywhere you look as some people believe. They are usually (but not exclusively) found near recently developed desert areas. If you are concerned, the experienced exterminators in the Greater Phoenix area can tell you if a particular neighborhood in their service area has scorpions or not. Scorpions become fluorescent with neon shades of yellow, green, and blue when they are exposed to a black light. If you own (or are willing to buy a black light), this is a much safer way of checking for scorpions than reaching behind dark or enclosed spaces. Here are some common sense tips that will help control scorpions. Close or caulk door openings, screen openings, and window cracks so scorpions can't get into the house. Dust and vacuum in corners and normally undisturbed places where scorpions hide. Eliminate the scorpion's prey (crickets, spiders, and other insects) by using common pesticides. Common pesticides don't work well on scorpions. Contact a professional pest control company if considering applying chemicals. Eliminate outdoor places where scorpions can hide, such as trash piles, rock piles, decaying wood or piles of junk. Don't walk around the house at night in bare feet. A professional pest control company can do a "blacklight" inspection to determine if there is a scorpion infestation since scorpions glow. Scorpions do sting. 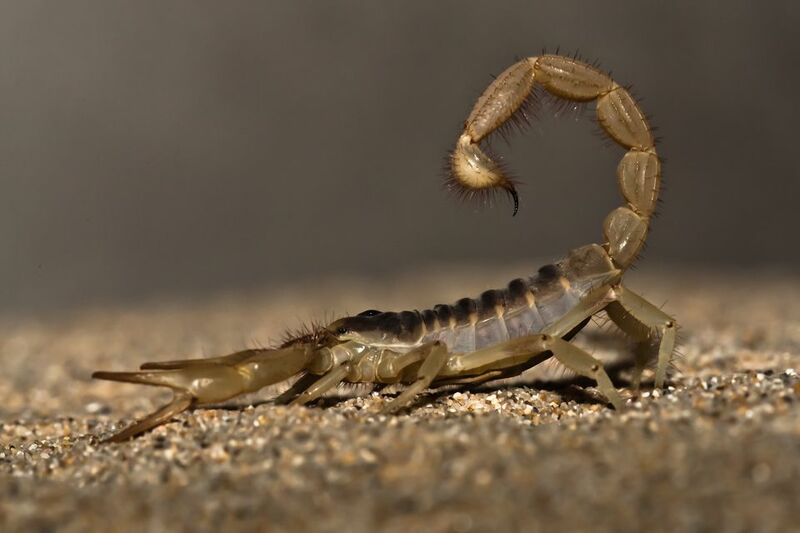 A scorpion sting may result in some pain, itching, swelling, or tenderness in the area. The great majority of scorpion stings occur on the hands and feet. Watch where you step with bare feet, and watch where you reach with your hands. In the western U.S., only one species of scorpion venom is considered very dangerous to humans, and yes, it lives right here in Arizona. It is called the Arizona Bark Scorpion. It is straw colored or opaque and usually less than 2 inches long. The Arizona Bark Scorpion is most dangerous if the person stung has an allergic reaction. There are other bark scorpions and other types of scorpions that are even more common in Phoenix homes than the Arizona bark scorpion. Most people assume they are seeing the most dangerous scorpion when they see any scorpion, which is a safe assumption to make since most people don't want to get close enough to distinguish the various species from one another! Bad news: every year many people in the world die from scorpion stings. Good news: hardly anyone ever dies in Arizona, because antivenin is available for severe cases. According to the University of Arizona "in the past 20 years, there have been no reported fatalities in the U.S. due to scorpion stings." Certain people may be allergic to scorpion venom just like some people are allergic to bee stings (or strawberries or peanuts...) although according to the same source no cases of that type of allergic reaction has been reported in Arizona. Special thanks to ​Matt Reinbold for sharing his knowledge of scorpions. Will Your iPhone Melt in Phoenix in the Summer?